Shop for 14k Gold and Platinum symbols of your faith from our incredible selection. 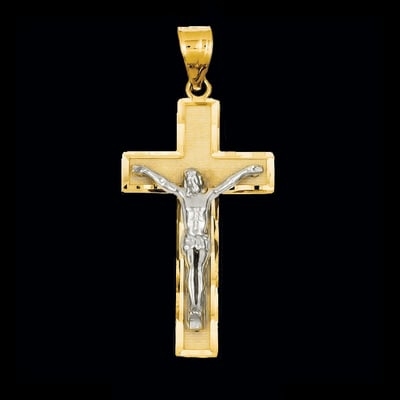 Looking for Silver Crosses, check out our new Sister Site, www.SilverSoulJewelry.com for quality Silver and 10kt gold selections. The tradition of the wearing and bringing of holy artifacts, articles, and jewelry dates back to the ancient times where it once served as a reminder of the select few who have gained God’s favors. However, during its evolution, holy jewelry is now considered more of a fashion statement than a religious affirmation. Prior to the establishment of Christianity, symbols of faith first became more pronounced and required during the Egyptian era. Jewelry made of gold became a status symbol for both the religious and wealthy, along with other semi-precious stones. Men and women adorned themselves with the all forms of spirituality like the scarab, which was a symbol of eternal life. Historically, Christian jewelry served more than one purpose. Particularly in the times of Christian persecution, jewelry designs such as the Ichthys or the fish was used to identify a believer from a non-believer to avoid those who are openly killing followers of Christ. Cross necklaces—a favorite example of cross jewelry is the rosary that contains the exact number of beads highlighting the mysteries in Christ’s life. Rings—there are papal rings, which are an exclusive item for the pope. Then there are the wedding bands that we commonly see in wedding ceremonies. Earrings—personal effects like earrings can be equipped with different Christian symbols and can be blessed to become holy items. Around 3 A.D., when Emperor Constantine made Christianity the official religion of Rome, many of the religious symbols associated with the faith began to take jewelry form. Celtic cross—characterized by a circle around the crossbar, the Celtic cross represents the sun, which was considered a deity by the Irish before the arrival of Christianity. Latin cross—it features a long vertical bar intersected slightly above center by a shorter horizontal bar. The Latin cross comes in two variations: The Latin cross with the depiction of Christ’s body, which represents Christ’s sacrifice and The Latin cross without the body used by the Protestants to symbolize the resurrection of Christ. Calvary cross—the distinct difference of the Calvary cross are its three graded steps, which symbolizes the hill of Calvary, the place where Jesus was crucified. Virtually, all religious jewelry is worn as a statement of one’s faith or as a requirement for prayers and spiritual activities. 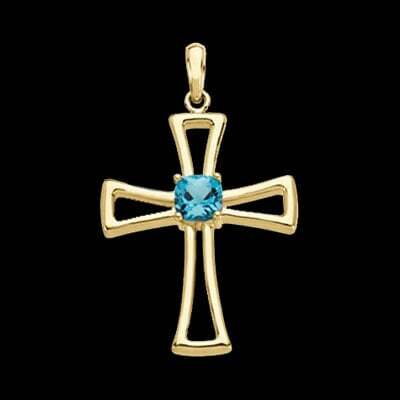 Christian Jewelry is dedicated to providing men with striking pieces that also represent one’s dedication to Jesus Christ. This includes specially designed jewelry items like rings, necklaces, and bracelets. In terms of fashion, there is no perfect bearer of jewelry than women. With both the looks and meaning religious jewelry provide, we can appreciate more the beauty of our mothers, sisters, friends, and lovers. Because only a few people can tell high-quality jewelry from cheap imitations, many folks end up paying more for less. Whether you’re a believer, or you simply appreciate the look of religious items, Gracious Rose has got you covered. With over a decade of experience producing excellent jewelry pieces, we offer only the best! Give religious jewelry as a gift today and let someone you love know you care. Find the perfect jewelry at Gracious Rose today!